I raced inside just as the first tree came crashing down at the edge of the backyard. Then another. Then another. I stood, mesmerized by terror as I felt this beast move from the backyard, down the space between our house and the neighbor’s house and out into the street before evaporating. We had no time to react. No time to run into the basement for safety. I just stood at one end of the house waiting for I don’t know what – the other end of the house to get ripped off? It seemed a strong possibility in that moment. Surely, a tree or large branch would come crashing down through that side of the house. All the trees falling over somehow missed the house. The most haunting feeling I had was that this ‘thing’ had a presence. It was a beast. It moved quickly, but not so quickly you couldn’t track it’s movement. I’ll never forget it. 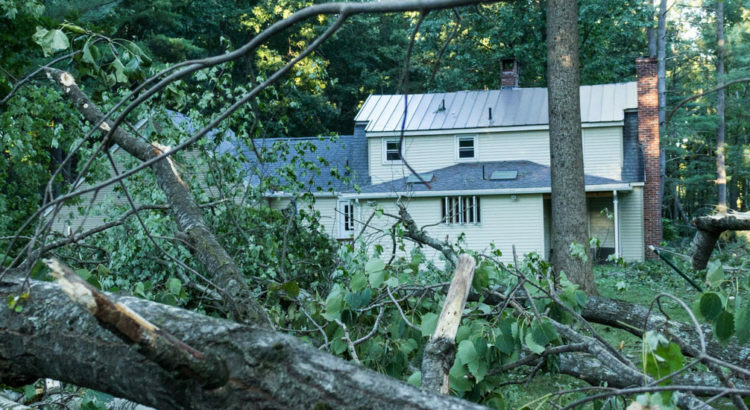 In the aftermath, even though over fifty trees were either uprooted or snapped in half and discarded, there was very little property damage to the four houses in its path and, thankfully, no injuries. Our neighbor’s shed was destroyed and cleanup will take months, but if that’s the worst after experiencing a tornado, I’ll take it.